Not only is it wearable, the fabric itself bends along two axies, thus allowing it to drape over curved services wrinkle free. Sounds like a smooth operator to me. The apps he used to "build" her are ZBrush and 3D Max two very sophisicated software programs used by virtually every major effects house in the world. When looking at this image, one sees that the creation of truly realistic synthethic people is almost complete. The only thing needed to finish the job is to make the eyes come alive. Once that's done, everything changes from making a movie to the making of a president. Slyvester Sextone has met his match. Much has been said about the Semantic Web but let's look at accurate definitions of it and see what is being done to make it reality. 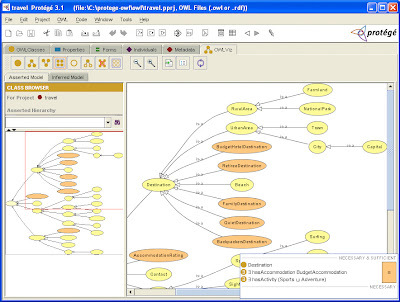 Wikipedia: "The Semantic Web is an evolving extension of the World Wide Web in which web content can not only be expressed in natural language, but also in a form that can be understood, interpreted and used by software agents, thus permitting them to find, share and integrate information more easily. It derives from W3C director Tim Berners-Lee's vision of the Web as a universal medium for data, information, and knowledge exchange." W3: "The Semantic Web is a web of data. There is lots of data we all use every day, and its not part of the web. I can see my bank statements on the web, and my photographs, and I can see my appointments in a calendar. But can I see my photos in a calendar to see what I was doing when I took them? Can I see bank statement lines in a calendar?" "Why not? Because we don't have a web of data. Because data is controlled by applications, and each application keeps it to itself." "The Semantic Web is about two things. It is about common formats for integration and combination of data drawn from diverse sources, where on the original Web mainly concentrated on the interchange of documents. It is also about language for recording how the data relates to real world objects. That allows a person, or a machine, to start off in one database, and then move through an unending set of databases which are connected not by wires but by being about the same thing." In other words...Data transparency and the assignment of meaning to data. 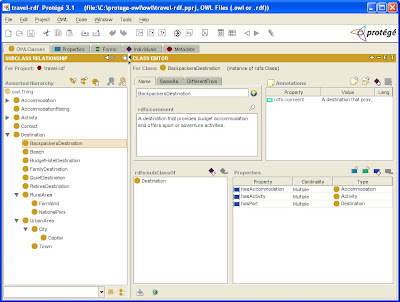 , the open source free ontology editor from Stamford University. Seen below are two screens of a travel app depicting how to conduct a trip. Users not only can modify, connect and expand the nodes in interactive fashion to build knowledge based applications but also can share this content with any application/software agent able to read how Protege models this kind of information. 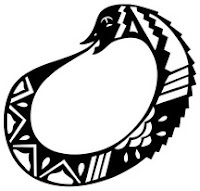 Because RDF and Owl (Resource Description Framework/Web Ontology Language.) 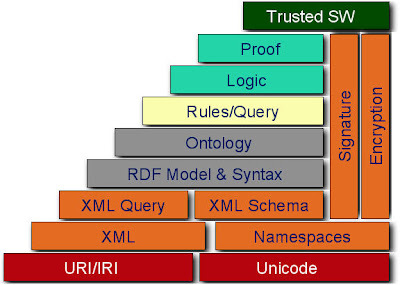 statenents can be combined in sophisticated fashion, the abilty to build machine readible ontogies, rules, logic and proofs will become reality as shown by the W3 diagram below depicting the building blocks of the Semantic web. Boggles the mind doesn't it? Msr. Tzara would be proud! 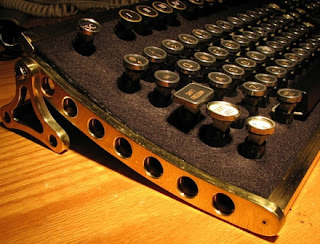 First there was Gibson's--purely conceptual--"cyberspace." Then various versions of MMORPGs (though the simpler ones actually predate Neuromancer). Most recently, we've graduated to the various takes on Stephenson's "Metaverse." What distinguises this version from the earlier ones is that it is explicitly conceived not just as metaphor or game, but as a way to blur the line between the two domains. These synthetic worlds might in some way be a next step in evolution. They are starting to generate their own economies, are tracked by major news organizations, are being 'colonized' by major 1st life corporations. Want a reality check? The US Congress is looking into taxing online economies! BUT (and it's a big but, at least for me) the navigation is still mostly based on keyboards and mice, which presents an almost-insurmountable barrier to the kind of immersion that would really realize the initial vision. Lots of work to be done in the world of haptics. The recent creation of open source metaverse tools--crude though they are in the first pass--may give us some leverage, as well as potentially speeding up the development cycle. I invite you to join me in 2L, interacting with either of the two avatars I maintain: MC2 Plisskin (call me 'Snake'), the male version, and ReiToei Xingjian, the more speculative female avatar. Just click here to get started (and it's free!). Prince is cool. However, this video was lifted from a portal site hosted on KICKAPPS.com. The video service is free to all and it encourages virtual networking with the hotlinked video player they call "widgets". This look very interesting for anybody interested in reaching a wider audience online. Kick Apps supports you with a large web portal technology and metrics for video with "my space" type of functionality.... all for FREE. They make money from the high volume of traffic and the advertising that pays for it. Go for it. "Combine data transparency with Jeff Han's vision of computer interface and you have the start point for Minority Report. Actually I'm not just that that single demo is 'nuff...nice pictures but not much context. As Elliott Masie says, "If content is king, context is queen." There are larger user interface issues, especially in regards a commercial implementation. This article says it nicely. No matter how fancy the technology--and the gestural interface is potentially revolutionary, especially in the context of the previous article--if it doesn't make it to market we'll never benefit. ...click the picture for more info. Something like this would be an alternate to the drafting table style interface shown in the TED video (nice riff on Minority Report, but not exactly portable. As my professors used to say, "It is left to the student to connect the dots." The vast web of rock'n'roll seems capable of stretching to include virtually any bizarre concept anyone cares to bring to it, but this strangely strange album clearly exists in a weird league all its own. Simply outlined, it consists of New York photographer Lynn Goldsmith reciting motivational self-improvement exhortations and emotional psychodrama, mostly in a synthetically altered ersatz-male voice, over busy dance music co-written variously by Sting, Steve Winwood, Tom Bailey, Nile Rodgers, Carly Simon and Todd Rundgren and performed by an uncredited crew, all ostensibly produced by Goldsmith. A phenomenal exercise of super-ego, this is both a Great Artistic Achievement and an unbelievably smug heap of horse puckey. 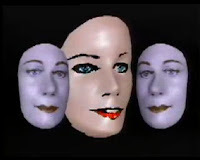 FYI - the rotating head made the greatest hits reel at the ACM SIGGRAPH conference (the Academy Awards of the computer graphics biz). 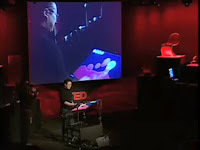 Combine data transparency with Jeff Han's vision of computer interface and you have the start point for Minority Report. Viewing this extraordinary video by mwesch substantiates The Intent of Technology post by illustrating how the transparency of data exchange is changing how civilization does business. When viewing sites like Extreme Tech, Techchrunch, Ars Technica and Digit, one is struck by the quality and depth of information they provide about tech whether it be a detail ed review about the latest and greatest in gaming computers or a thoughtful discussion about the impact Ruby on Rails is having on code development but what is not talked about is the inevitable tradeoffs that occur when anything new like this is introduced into the environment. For example, the web is the prime driver of tech in the world because it has established a set of hardware and software standards that allow anyone with a net connected computer to communicate effectively with anyone else who has the same connectivity. This transparency of data exchange is why technology is accelerating at a double exponential rate and is changing every aspect of our lives in ways that could not have been imagined just a few years ago. At the same time, this engine of creative and technologal advancement also has eliminated privacy and could give rise to governments that combine aspects of Brave New World and 1984 using the same transparency of communication that people use when surfing the net. Tech has no morality. In Termaninator 1, the cyborg was bad, in T II, the Terminator was good. The difference, programming. This simplistic example is the kind of approach BRT will be taking in looking at the social and political impact science and technology is having on society. It will be a most interesting journey. 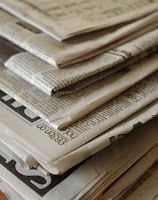 According to new and revised data from the World Association of Newspapers, newspaper circulation is growing and new newspapers are being launched at a remarkable rate. Even in North America and Europe, both circulation and the number of new titles have increased, according to the updated data. Timothy Balding, CEO of the Paris-based WAN, says "What we are seeing completely contradicts the conventional wisdom that newspapers are in terminal decline.... The fashion of predicting the death of newspapers should be exposed for... nothing more than a fashion, based on common assumptions that are belied by the facts." Mr. Balding concludes that "These trends also indicate the widespread, but often overlooked, innovation that is occurring in the newspaper industry... Even in the most developed markets, there has been a proliferation of new genres of newspapers, targeting new audience segments and generating creative marketing and distribution scenarios..."
Balding noted that newspapers represent a nearly 180-billion-dollar industry worldwide, with more advertising revenues than radio, outdoor, cinema, magazines and the internet combined. More than 6 billion euros has been invested in newspaper technology in the past five years, and the industry employs nearly two million people world-wide. The latest World Press Trends updates can be accessed at the bottom of the page accompanying this release. Here is a video as a demo with no sound. So what do you think? Are we seeing an evolution of of something very powerful, or is this an illusion. It's only technology, but what we do with it has the impact that we sometimes overlook. When the question came up "why should we do this blog ?" , I just said "why not?" Let's all take a stand about the IMPACT, the DANGERS and the BENEFITS of science and technology to our existence. This includes all derivations of our activitities as inhabitants inside a dynamic planet. We see amazing things all the time and yet rarely have time to consciously re-invent or share new ideas for inspiration, wisdom and creativity. Our blog BEYOND REAL TIME will reflect upon some of the deep issues and insights that we discover to create new possibilities for the FUTURE. And We do IT BECAUSE ....We feel like it! We find it interesting and powerful to share this with each other, to leverage our collective wisdom and experience. Perhaps the world will benefit over time when more people participate in meaningful dialogue, so let's invite more people to share in this created space. BEYOND REAL TIME is the cybernetic vehicle we created from our common bond as friends and colleagues: TO CAUSE AN IMPACT BEYOND OURSELVES AS INDIVIDUALS. In the Buddhist view, there are no boundaries or separation between people, objects or ideas other than the ones we create in our minds. Let's move in this direction and JUST DO IT, the results and impact that develops will be very . When we are empowered as individuals participating as a group, BEYOND REAL TIME will have a life of its own.